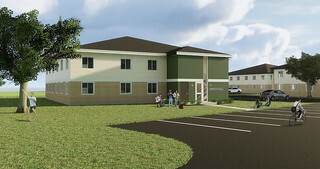 Batavia, New York — Student housing facilities that are now 35 years old are slated for a multi-phase renovation plan starting this spring, Richard Ensman, director of Development and External Affairs reported to Genesee Community College’s Board of Trustees Monday evening. 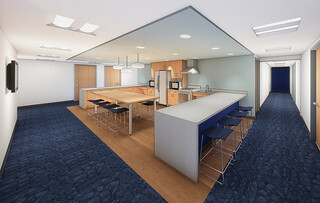 In the first phase of renovations at College Village, GCC’s apartment-style student residence community located adjacent to the Batavia Campus, Pine Hall and Birch Hall will both be extensively refurbished, but following completely different design plans. The most exciting transformation will be Birch Hall, the most northern building in College Village. Following the community style “pod” plan, the two-story facility will not only be gutted, but the mansard roof will be removed and two stairwells will be added to opposite sides of the building. Each floor will house 14 students with individual bedrooms, but in the center of each floor with be a large, shared kitchen, gathering space, bathrooms and laundry facilities. Pine Hall, on the other hand, will not see elaborate structural changes. Rather, this three-story building will continue to house 40 students but the entire building will be revitalized with new kitchens featuring a breakfast bar and new appliances, new bathrooms, lighting, furniture, paint and many other aesthetic improvements. In addition, the “D” suite of Pine Hall, which was once the College Village central office, will be converted into two studio apartments ideal for graduate assistants or possibly student residents who may have special needs. “We will be testing these new facilities to see how students respond to them,” Ensman added. The results, observations and student input will help guide the next two phases of the College Village multi-year plan. At this time, Beech, Cedar and Oak Halls are pegged to be renovated like Pine Hall in 2019, and in 2020, Maple and Spruce Hall will follow a combination plan of developing a community style building similar to Birch, and also traditional refurbishing like Pine. Ensman said that construction documents will soon be released and hiring local contractors and subcontractors will be a priority, especially given the tight project schedule. Construction should be completed by the start of the Fall 2018 semester. Approved the Hazard Communications Policy #6007, which is the last College Policy to be reviewed and updated in the multi-year Policy review effort chaired by Trustee Benjamin J. Bonarigo, Sr., Esq. and supported by Trustee Jacalyn F. Whiting. Heard Provost and Executive Vice President for Academic Affairs Kathleen (Kate) Schiefen report on the following three SUNY Performance Improvement Fund (PIF) initiatives that are part of an overall SUNY program to help strategically boost enrollment through a special $100 million, multi-year SUNY wide program founded, in part, by former SUNY Chancellor Nancy Zimpher. (1) Accelerated Learning Program (ALP). Following a successive pilot program by JoNelle Toriseva, GCC’s director of English and Communication Arts, ALP helps students accelerate through remedial English and reading by pairing them with special support services in their English 101 class. The pilot has been so successful that GCC is looking to expand the program with faculty in other academic areas. GCC was awarded $5,000 for this effort. (2) Cultural Competency Training or Project 129 is part of a statewide Diversity and Inclusion Educational Strategy to increase awareness and reduce the inherent bias of hiring committees, and increase the number of underrepresented minorities while also improving perceptions of GCC as an inclusive campus. In addition to special training and professional development for faculty, staff and hiring committees, the $179,000 award will also cover the hiring of an adjunct minority faculty member(s) for a one-semester internship(s). This internship program replicates the Alice Young Minority Internship Program at Monroe Community College. (3) A new partnership with Alfred State College (ASC) focuses community college adult students and their career potential in the targeted areas of human services, nursing, healthcare management, technology management and construction supervision. The partnership includes all community colleges in Western New York with each campus hiring a part-time coach or navigator to help recruit and guide adult learners through the online learning and then transfer process. Heard Student Trustee, Benjamin Martis report on various initiatives with GCC Student Government Association. “A Peer Counseling” is a new program that seeks to train students to help their fellow students by acquiring good listening and communication skills. This will help students who not want to seek formal counseling. The SGA also attended a library review session and discovered the value of GCC’s Alfred C. O’Connell Library in comparison to other institutions. Finally, the a new Communication Committee will be using social media accounts to help GCC students realize how the SGA serves as their voice for all kinds of College-related topics, including the changes in the American Dining Creations.